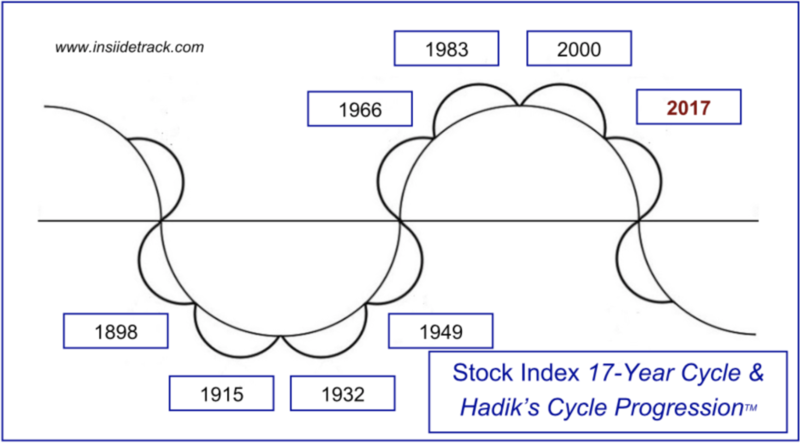 Late-July through early-September represents an extremely precarious time in the stock market, when a myriad of cycles – ranging from 40-Year & 80-Year Cycles down to multi-week cycles – pinpoint the most likely time for a sharp correction in equities. Specific downside price targets are also forming and will be discussed separately. Those phases include the years of 1773 – 1781, 1813 – 1821, 1853 – 1861, 1893 – 1901, 1933 – 1941 & 1973 – 1981 – projecting focus to the 7th and most decisive phase in 2013 – 2021. In each phase, there have been remarkably similar events and battles (mostly economic/financial battles but the overarching 80-Year Cycle has also timed America’s most challenging and culture-shaping military battles as well – next coming into play in 2021) – all of which included struggles with currency (paper/fiat & hard/metals), investments (stocks, bonds & others), food (crop crises) & the overall economy (bubbles, panics, crashes, recessions & depressions). In most of those cases, the ‘3’ – ’6’ years (and into the middle part of the ‘7’ year) would time the precursor events – the ramifications of which would be more strongly felt and recognized in the ‘7’ – ’1’ years (i.e. 1933 – 1936 & 1937 – 1941, etc.). 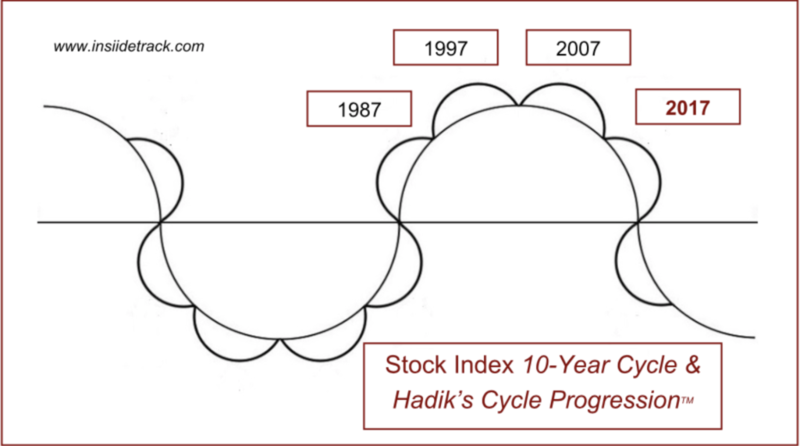 Since this overall cycle encompasses a total of 9 years, the midpoint (mid-‘7’ year) is the most likely time for significant shifts to take hold. 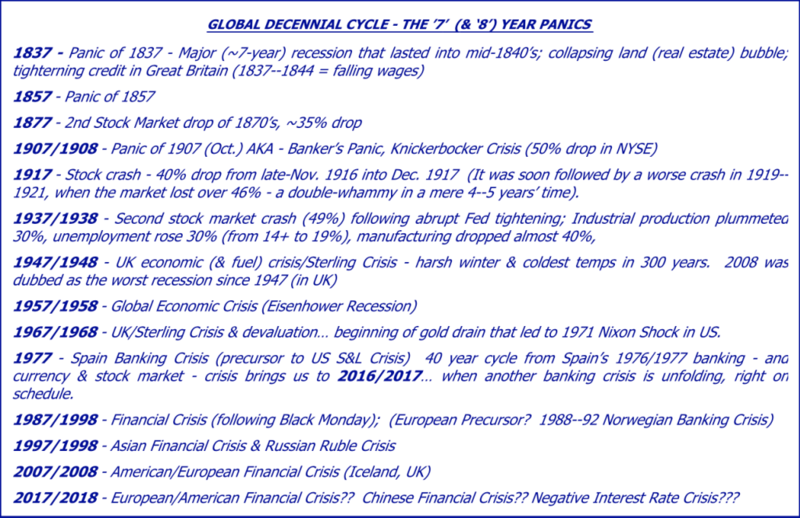 In many cases, the ‘7’ year also experienced serious ’panics’ of some sort… a reaction to the events that had preceded it (see Global Decennial Cycle table, first published in Dec. 2016 INSIIDE Track, which includes corresponding events in Europe). In the current phase, that augured initial events (the projected ‘actions’) in 2013 – early-2017 followed by the consequences (resulting ‘reactions’) in late-2017 – 2021. In many of those prior cases, the ensuing up phase did not take hold until the following ‘2’ year – most recently observed in the 1942 & 1982 stock market lows… the onset of major, subsequent advances. That also dates back to America’s founding and the coinciding collapse of the Continentals (first foray into fiat currency) – lasting into 1781. The recovery began in 1782. 40 years later, the Panic of 1819 – linked to the charter of the 2nd Bank of the United States in 1816 (as well as the fierce & contentious battle that preceded it) and a subsequent credit tightening – plagued America’s economy through 1821. Once again, a recovery did not take hold until the ‘2’ year (1822). Another 40 years hence and it was the Panic of 1857 that triggered a multi-year retrenchment. The Civil War – beginning in 1861 – triggered a shift to a more inflationary environment. That is very similar to what occurred 80 years later – when the economic malaise of the 1930’s had to wait until America’s entry into WWII in 1941 – before reversing course. As a result, the economy came back to life in 1942. That perfect storm of inflationary events (all of which threw off the accountability & stability of gold-backed currency and flung open the door to inflationary paper currency) – triggered the most intense commodity inflation of the past century, most acute in 1977 – 1980. This time, digital or crypto-currency are joining in the fray and promise to further exacerbate this vicious battle for economic supremacy. During the 1977 – 1982 period, the stock market had two 15 – 18 month declines of 25 – 30% each. In between those two declines, the DJIA had two additional noteworthy drops – lasting 2 – 3 months each and shedding 15 – 20% of its value, each time. So, in that 4 – 5 year period, there were four stock market declines of 15 – 30%. That is just one of many reasons (cyclical, technical, fundamental, geopolitical, climatological, geophysical, etc.) I have been expecting 2017 – 2021 to produce similar economic challenges… and why I still expect a new bear market to take hold in stocks in 2017/2018 – AFTER stocks have reached their upside wave targets. In some ways, 2017 – 2022 could possess similarities to 1977 – 1982, particularly the part in which sell-offs are quick & violent (similar to 2015 – ’16) and followed by prolonged consolidation phases. There are also some very distinct expectations for 2017 – 2021, due in part to many of the secondary cycles & technicals (as well as fundamentals) in play at this time. A perfect example is the interplay of the 40-Year Cycle & 17-Year Cycle, described the past few years. While the 40-Year Cycle is projecting an overall topping process in paper assets (stocks, bonds, dollar) in 2015 – 2017, the 17-Year Cycle projected a sharp ~20% or greater correction in mid-2015, followed by a final peak in 2017 – 17 years from the 2000 stock market peak. 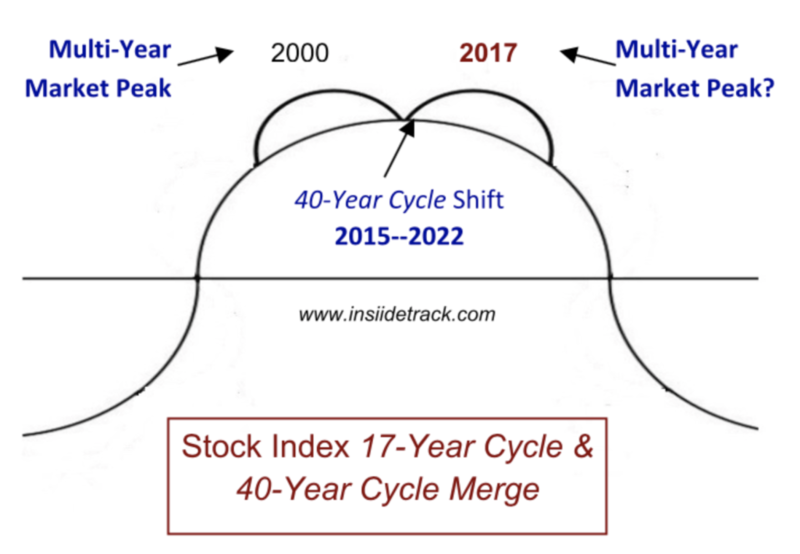 The ’17-Year Cycle & 40-Year Cycle Merge’ diagram illustrates this overlap but one must see the precise & uncanny nature of the 17-Year Cycle to truly appreciate it. Since 1898, it has precisely timed multi-year & multi-decade turning points in the DJIA – leading up to the 2000 peak. A subsequent peak is expected 17 years later – in 2017. The most consistently bearish period – during the majority of ‘7’ years since 1857 – was from July into November. 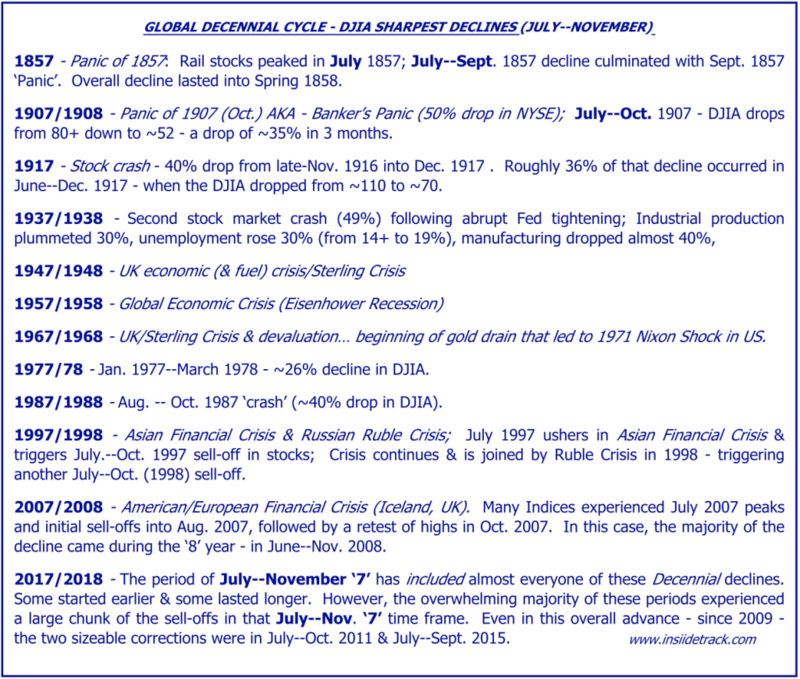 And that reinforces analysis published in the Jan. 2017 ’40-Year Cycle: Stocks in 2017 – 2021’ Report, describing why the final decisive high in 2017 should be in July and why July – Sept. 2017represents the midpoint of a 4-Year Cycle that timed sharp declines – surrounding & encompassing the month of August – in 2007, 2011 & 2015 (and expected to do the same in July – Sept. 2019 – an even more significant cycle). Consider the following pattern of the past 20 years (with only 2003 representing a failure of this consistently bearish period, surrounding the 3rd Quarter of every other year) …. July – Oct. 1997 – Asian Financial Crisis sell-off. July – Oct. 1999 – Sell-off before final spike high of early-2000. May – Sept. 2001 – Drop leading into 9/11. July – Aug. 2007 – Sell-off before final high. July – Oct. 2011 – Sharpest part of May – Oct. 2011 decline. July – Oct. 2013 – Sideways correction, leading to Oct. ‘13 low & new advance. July – Aug. 2015 – Chinese equity meltdown (30–40% drop) infecting global stocks. July – Oct. 1998 – Russian Ruble Crisis & corresponding global equity sell-off. Aug. – Oct. 2000 – 2nd sharp decline in developing bear market. June – Oct. 2002 – Sharpest decline in 2000–2002 bear market (that bottomed in Oct. 2002). June – Oct. 2004 – 2nd half of 2004 sell-off. May – Nov. 2008 – Overall market meltdown – exacerbated by Lehman Bros. collapse, AIG insolvency & Fannie Mae/Freddie Mac debacle. Aug. – Nov. 2016 – Market correction, leading into US Election equity low. There is another, clarifying cycle that additionally hones this analysis. It involves a 3-Year Cycle and an uncanny proclivity for sharp, double-digit declines to occur between late-July & early-September. That topic is discussed elsewhere. However, all of this merely addresses timing. There is another factor that is just as decisive as this collision of cycles occurring in July – November 2017. It is price action! As any Weekly Re-Lay or INSIIDE Track reader knows, price action is the ultimate filter. Cycles set the stage, but price action MUST trigger the corresponding acts and action. “The 40-Year Cycle remains in a larger-degree transition phase whereas the Decennial Cycle is focused on the potential for a surprise sell-off at some point in 2017 (likely carrying over into 2018). That 10-Year Cycle has timed repeated ’panics’ and/or sell-offs in the ’7’ – ’8’ years in each of the past 8 decades & 13 of the last 18 decades. And, as described about a year ago, it also coincides with the anticipated ’Curse of the Republican President’ – that was expected to take hold a few months after the inauguration of a (potential) Republican Administration. As repeatedly stressed, these cycles are like a wooden roller coaster with multiple cars slowly moving over a peak. Until all the cars have passed that peak, a convincing & accelerated decline cannot take hold. In the meantime, there are some critical upside objectives to monitor – based on wave relationships, yearly extremes & yearly projected resistance. The wave objectives were confirmed when the Indices exceeded their 2015 highs and validated ‘5th’ wave advances (as culmination to the overall rally since 2009). That synergy of price targets comes into play at 21,616 – 22,030/DJIA & 2465 – 2531/SPX, with a less-synergistic objective at 5414 – 5592/NQ. Stock indices needed to reach these multi-year upside targets before each one would summit the peak of the ‘roller coaster’ and prepare for an initial, accelerated decline. BUT… all of them needed to peak before any of them could suffer a sharp decline. The DJIA & SPX have just attacked these levels in late-July as equities enter the first phase of the Decennial Danger Period – from late-July into early-September. (The Nasdaq 100 did the same a few weeks prior.) The uncanny coincidence of these multi-year price objectives being met at the precise convergence of multi-year & multi-decade cycles demands close scrutiny as we near the month of August. Could additional spike highs be seen in August? Absolutely (at least in some indexes). But time is running out… at least for this latest phase of a prolific bull market. In 2011, 2013 & 2015 (as well as 2016), the DJIA suffered significant sell-offs between late-July/early-Aug. & late-Aug./early-Sept. – further honing these cycles. Could August 2017 repeat? Daily & weekly indicators are lining up and could trigger a decisive sell signal in the coming days. If that occurs during the first week of August, it would provide the latest and most important confirmation to this overall outlook. But, that would just be the first step of a potentially precarious journey from mid-2017 – 2021. Eric Hadik is President of INSIIDE Track Trading and the editor of INSIIDE Track and the Weekly Re-Lay. More information can be found at www.insiidetrack.com. Corresponding analysis on the 40-Year Cycle & 17-Year Cycle can be found at www.40YearCycle.com & www.17YearCycle.com.